This weeks Top Ten Tuesday list (weekly meme hosted by The Broke and the Bookish) is the My Top Ten Favorite Heroines. As I made my list, it occurred to me that a lot of my favorite characters ended up being made into movies or TV series. Some not so successful (Katherine Heigl as Stephanie Plum, I'm looking at you), some very successful (Anna Paquin as Sookie Steakhouse, I'm looking at you too.). Anyway, here is my top ten list. Mostly of women I'd like to be friends with in real life, or at least read a lot more about. 1. Stephanie Plum. I love all the early Janet Ivanovich books in the Stephanie Plum series. Four to Score made me laugh out loud over and over. Sally Sweet was an inspired character- I wish I could see him make a return appearance in the series. I do think the last four Plum books have been obvious phone-ins by Evanovich, but early on, I loved Stephanie Plum! I couldn't decide between Morelli and Ranger, so I couldn't expect her to. 2. Penelope Keeling from The Shell Seekers by Rosamunde Pilcher. Penelope is exactly the old woman I want to grow up to be. Hands down, one of my favorite books. 3. Jemima J. One of my favorite Jane Green novels. Jemima is an overweight girl who remodels herself - but finds out she was pretty great all along. Very inspiring and it's $1.99 right now! 4. 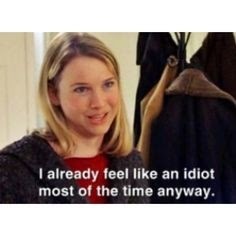 Bridget Jones. The original, irrepressible Bridget. Who makes me feel good about feeling like an idiot most days. 5. Darcy from Something Borrow and Something Blue by Emily Giffin. I liked Rachel more than Darcy in the first book, but by the end of the second book, I was Team Darcy all the way. I hated Kate Hudson's portrayal of Darcy in the movie. 6. Sally Owens in Practical Magic by Alice Hoffman. Love Alice Hoffman, but her characters are usually so melancholy. Sally was melancholy but unforgettable. I think Sandra Bullock actually did a great job realizing that character on the screen. 7. Miranda Priestly in The Devil Wears Prada by Lauren Weisberger. I know most people thought Andie was the character to root for. But I thought there was a lot more to Miranda than most people saw. 8. Sookie Stackhouse from Charlaine Harris. I read all the books before I started watching the TV show. I liked Sookie's spunky attitude, and the never ending hot men around didn't hurt the story! 9. Cannie Shapiro from Good in Bed by Jennifer Weiner. Cannie was an awesome heroine. She faced insecurity, heartbreak, career meltdowns and an unexpected pregnancy and she just kept going, one foot in front of the other. Strong stuff, that one. 10. 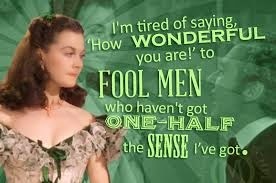 Scarlett O'Hara. Because duh.